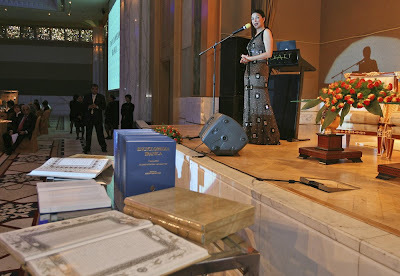 Shohreh Aghdashloo at the Iranica Gala in Dubai. May 2, 2008. Photos/Kamran. This is part two of our ongoing series on Encyclopaedia Iranica. Part one, from March 2005 in New York City, can be found here. Part two is from a report back in May 2008 in Dubai. Check back to this page for upomcing Encyclopaedia Iranica events this year. Iranica can be accessed free online here. Before many schools and universities were turning to the United Arab Emirates for funding, Manouchehr Houshmand started a grassroots effort in Dubai to help raise money for Columbia University’s Encyclopaedia Iranica. 2003. Other countries covered include Tajikistan, Baluchistan, Kurdistan, and parts of Pakistan, India and the Caucuses. In 2002, prompted in part by the loss of three Iranists in the span of six months, Iranica changed strategies and began soliciting submissions irrespective of the alphabet. These entries are first published online — and searchable at Iranica.com — and later when their turn comes, in print editions. The first fascicle, or part, of Volume 14 was recently sent to the printers, according to Houra Yavari, an assistant editor at Iranica in New York City. She was in Dubai for a fundraiser last weekend at the Grand Hyatt. “It was one of the most memorable that I’ve participated in 20 years of my involvement with Iranica,” Ms. Yavari said, referring to the program. Mr. Houshmand, an entrepreneur, said until now fundraisers had been increasingly successful since he started the Dubai association to help Iranica five years ago. Though the final tally was not in, it was not expected to reach last year’s more than USD $100,000 raised. Timing may have played a role. It did not appear to help that the fundraiser came at the heel’s of an auction at Christie’s in which wealthy Iranians paid record prices for works of art from Iranian artists. But prospects were expected to improve, especially with a little help from Hollywood — and perhaps one of Dubai’s newest residents. Shohreh Aghdashloo, who plays Saddam Hussein’s wife in an upcoming television drama from the BBC and HBO, “Between Two Rivers,” made her first trip to the U.A.E. with her husband, Houshang Tozie, a theater director. She was nominated for an Oscar in 2003, for her supporting role as Ben Kingsly’s wife in House of Sand and Fog. Ms. Aghdashloo said she was eying Dubai as a second home. “I love it, love it, love it,” she said. “The people are very warm-hearted. It’s very clean. And it’s geographic location is great.” Asked whether she was referring to Dubai’s proximity to Iran, Ms. Agdashloo’s smile grew even bigger. Philippe Welti, Switzerland’s Ambassador to Iran, flew in from Tehran to support the project as well. After Sept. 11, 2001, journalists turned to Encyclopaedia Iranica to learn about Afghanistan, part of the “Iranian cultural continent.” The staff of Iranica, headquartered at Columbia University’s Center for Iranian Studies, is now at work on the 13th volume, which includes the letter “I,”–and the current focus: Iran. Despite his smiling face on the Encyclopaedia Iranica Web site, managing editor Ahmad Ashraf tends to wear a solemn countenance and drives himself and his staff as if they were on a newspaper deadline. Housed in a small duplex in the back of a stately turn-of-the-century building near Columbia University, the tension is palpable inside. It may not be like the first draft of history that journalists have to rush out, but a race against time nevertheless to pare down centuries of work sometimes known only to an aging few, then struggling with the thankless task of rendering it into clean, lucid English translations from Persian, French, Chinese and other languages. Billed as “an index of the histories, cultures and accomplishments of Iranian peoples” by the National Endowment for the Humanities, which has been the main source of support for the massive scholarly project, “the articles, according to evaluators, have really broken new ground,” said Helen Aguera, a senior program officer at NEH. Its first volume came out more than 20 years ago, and the project is less than half done. Twice a week, Ashraf commutes from his home in Princeton, N.J. to New York City. He arrives at his office early Monday morning and returns home late Tuesday night, and works again Thursday morning through Friday evening. Executive editor Manouchehr Kasheff, a former student of Yarshater’s who has taught Persian language at Columbia since 1974, said it was certainly not the meager compensation, but the “devotional interest” in the project that drove him and other in-house editors to sit at a desk in a dark, cramped office during the week “where they have no room to hang our coats properly” and to give up their weekends. 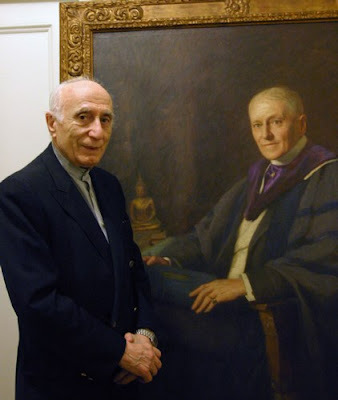 In 1990, Yarshater established the Encyclopaedia Iranica Foundation and bequeathed to it his entire estate. By 2000, Yarshater had donated to the foundation his personal collection of rare books and art, which included first editions of James Joyce’s “A Portrait of the Artist as a Young Man” and “Ulysses,” one of only 750 copies on handmade paper; Islamic art; and works illustrated by Chagall, Matisse and Picasso. Auctioned off, the collection brought more than $1.4 million for the project. Citing his personal example, Yarshater has convinced the consulting editors to work without pay. Forty-three scholars from major international academic institutions serve as consulting editors. There are seven in-house editors, three of them part-time. Of these, Yarshater and three others are of Iranian origin. In an interview in his second-floor office, 84-year-old Yarshater rattles off events in detail and names in full without a pause. Yarshater’s small paneled office, decorated with antiques and lined with books and encyclopedias, has a Parisian aura. A Persian rug and framed Persian art and calligraphy infuse the space with the warmth of his homeland. How many volumes remain? It depends on whom you ask: 10, 20–perhaps 30 more volumes. “Persia has at least 5,000 years of written history if we count Elamite civilization in southwestern and central Persia, and of course many more millennia of prehistory,” Yarshater said. “Persian culture has been a fertile one–not in all spheres–but in most. It has given the world great literature, distinct art and superb mystical poems. So all together, there is a great deal to cover. And this will require, not one volume, not two volumes, not three,” but at least “40 volumes.” And it will not stop there. Revisions, updates, biographies of those who have since passed away, will fuel future volumes. The complexities of the project are clear from the very first entry. Ab–water–the essence of life, a basic element in Islamic purification ritual, has been among the first three words taught in Iranian first-grade texts since the days of the shah and through the Islamic republic. Made up of the first two letters of the Persian alphabet, Ab commands 14 meticulously researched entries in the Encyclopaedia, from Ab Ghusht, a staple Iranian dish, Ab Ghureh, a popular cooking ingredient, to Ab Nahid, “Nahid of the Water,” a Zoroastrian woman’s name that first appeared in a poem of the late Parthian period, according to that entry. On a trip to Iran in the 1970s, Yarshater met with Prime Minister Amir Abbas Hoveyda and convinced the government to fund the project. For the first four years, Iranica carried out its research without any financial difficulties. In 1979, the project was derailed by the Islamic revolution. Faced with the prospect of the project’s collapse, Yarshater had to find financial resources elsewhere. He approached the National Endowment for the Humanities at a time when the hostage crisis was going on in Iran. According to Aguera, Iranica is one of very few long-term projects that continues to receive funding from NEH. The continued support is based on the first-rate quality of the scholarship, she said. “Among the encyclopedia projects, it’s singular in scope. In terms of sheer volumes projected for the series, it’s one of the most ambitious.” To date, Iranica has received more than $4.7 million from NEH. Ashraf’s ambitious plan is to have the main entries completed within 10 years. Though Iranica has provided “the best documented and most detailed entries on the Shiite branch of Islamic faith,” Yarshater said the Islamic government has never supported Iranica, “because we treat minorities exactly as others. In fact, we make a point of redressing the neglect of the ethnic, religious and other minorities,” including the Baha’is, Yarshater said, referring to a religious movement originating in Iran in the 19th century. Much of Iranica’s work is topical. After Sept. 11, 2001, journalists went to Encyclopaedia Iranica to learn about Afghanistan. And calls from the BBC, Voice of America and journalists are common, said Dina Amin, assistant director of the Center for Iranian Studies, which encompasses Iranica. The next volume, which will include “I” for Iran, may in some respects prove the most complicated. Until earlier this month, the staff could not settle on an expert on Iranian literature. For the Iran-Contra affair, the editors approached Gary Sick, who served on the National Security Council under Presidents Ford, Carter and Reagan. Sick directed them to an expert at the U.S. National Archives for an entry, Ashraf said. Three years ago, prompted in part by the loss of three Iranists in the span of six months, Iranica changed strategies and began soliciting submissions irrespective of the alphabet. These entries are first published online–and searchable at Iranica.com–and later when their turn comes, in print editions. Yarshater is also rushing to try to make sure the project has enough money to be completed. The endowment fund he began in 1990 needs to grow. That’s one reason he will not accept a salary. Drawing a salary, Yarshater is afraid, will diminish the fund-raising power of the editor. “There is always the idea in the back of people’s mind that so and so is helping himself,” he said. Therefore, “I’m anxious that before I become incapacitated the endowment fund reaches its target of $15 million. Once this target is reached, I will rest in peace knowing that the Encyclopaedia Iranica project can be continued on a self-sustaining basis. “With a little help from here and there, we’ll manage,” he said. You are currently browsing the archives for the Encyclopaedia Iranica category.